The idea for this conference started about a year ago, when Ian Marcellana , Dan Huber , and Chris Strachan approached me with this idea at the Spring 2015 judge conference. They wanted to host a conference at Stevens Institute of Technology, a university that we all studied at. We talked about it over a few months, and decided after the Fall conference to make an official proposal. Paul Baranay signed on at this point as a co-organizer with Ian and myself, and Shawn Doherty gave his approval. 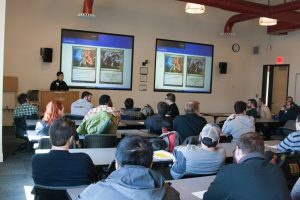 This is interesting in itself – most Judge Conferences that I’ve heard of or been to are hosted at Local Game Stores, and a few at Grands Prix. Apart from a few regional conferences at innovative venues, most conference venues are chosen based on what can be had for free. 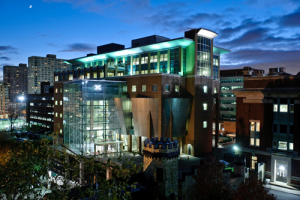 The Northeast’s last two conferences were hosted at the Philadelphia Convention Center and at the University of Massachusetts at Amherst, and both approached 150 attendees, so we knew that we would need a similarly-sized venue. Of course, cost is always a concern. Luckily, with the support of some student groups on campus (the TCG Club, and the Computer and Console gaming Society) we were able to get access to some great space for free. We chose this date because it was about 4 months out from when we initially proposed the conference, and about 6 months out from the Northeast’s previous conference. The date was de-conflicted against nearby Opens, GPs, as well as Prerelease and RPTQ windows. There were only four suitable dates from January through June, and two were early enough that snow/cold weather was a concern (and we could not have organized it quickly enough). The other date was in June. Easter weekend is a relatively minor conflict for a Judge Conference in the grand scheme of things, as evidenced by our high turnout. The date was announced at least two months beforehand, which worked well. Most judges registered well before the deadline, and we had few certified judges withdraw, and even fewer no-shows. Feedback is important, and we wanted to make sure we had a way to deliver feedback to our presenters as well as to get feedback for ourselves. However, using a paper form that we have to type up means a delay in getting that feedback to the people who can use it, and I think most judges will agree that the best feedback is timely feedback. Ultimately, we decided on an electronic feedback form, but printed out a small number of paper copies for people who might need one. You can see the online form we used – feel free to click through, submissions don’t go anywhere anymore. OK, I should be fair. This isn’t /new/ tech, it’s just rarely used. There are videos on the internet of a Southeast US conference from last year(? ), and there are videos of several judge conferences from 2013 on Youtube. To my knowledge, with 20 out of 23 seminars recorded, edited, and posted, this was the largest Judge Conference that has been made publicly available. (The presentations that aren’t online are two small group discussion seminars and one presenter who opted out.) We also streamed our largest room live to the internet, and even though we considered this strictly experimental (and audio levels were pretty bad at times), we had a good number of people come in to watch the stream. I should talk a bit about how we did that. The recording was done using GoPro Sessions, which are the smallest form factor GoPro. The stream was run off of a GoPro Black, which has an HDMI out, which fed to a capture card and from there to a dedicated laptop. The audio was all onboard, which actually wasn’t that bad after editing, though levels on the live stream were terrible. We’ll want a real mic for next time, and software that lets us apply some EQ and compression. I’m thinking about getting a Zoom, but it’s important to not create too many things that the operator needs to turn on and off. We recorded in 1080p, which meant that the GoPro would use a little more than half of a 64GB memory card in 3 hours. We copied the data off the SD cards at lunch, which took a little over half an hour. Editing was done using Premiere Pro and Audition. As I’ll mention later – PDF slides can be converted into images using a website, PowerPoint can also directly export to PNG. Anyway I’m excited to keep pushing the envelope on this. We’ve already had some great feedback from presenters and attendees – and I know that at least two presenters received formal feedback about their presentations from someone who only saw it online! If that isn’t enough to convince you that this is valuable, then I don’t know what will. At least one past Northeast conference used Room Leads who would be responsible for setting up the Powerpoint, introducing presenters, and keeping track of time. We did this as well, with the added responsibility that the room leads would press “record” on the GoPros. This worked pretty well – we remained on-schedule, and several of the presenters commented that they were glad someone had already set up their slides and was there to quiet down the room and introduce their talk. The Room Leads all did a great job and removed a lot of stress from the organizers over the course of the day. On the tech side: Many presenters used slides of some sort. Some needed internet access for a video or to show other assets. Some used PowerPoint. Some used Keynote. One used OpenOffice. One used LaTeX. Two used Prezi, which is quite nice for presenters, quite nice for attendees, but terrible for tech. We didn’t place any requirements on presenters, but I suggest that future groups consider this. PowerPoint, Keynote, OpenOffice, and LaTeX can all be converted to PDF as a “backup” to prevent incompatible software issues. PowerPoint and OpenOffice can be converted to .ppt or .odp, which most computers should be able to handle. I don’t know what Keynote is compatible with. Prezi users were unable to provide an “offline” version of their talk. In addition to having a backup in case of no internet, this is also important if the conference is being recorded. I can get PDFs into Premiere Pro, and I can get anything that I can open in PowerPoint into Premiere Pro. I can not, however, get a Prezi, or a Keynote file that I was never sent, into Premiere Pro. So, for conferences that are being recorded, it is worth encouraging presenters to make sure they can save their presentations as PPT or ODP. Regardless, I do recommend that conference organizers strongly encourage having offline backups. We were confident that we would be able to get at least the room leads’ laptops onto campus Wi-Fi, but still wanted backups – and not having all of them caused a bit of stress when one of our room leads cancelled and the replacement laptop I supplied couldn’t get on the Wi-Fi to access Prezi. Running the conference at a university helped us in a few ways. First, we didn’t have to worry about room setup – we didn’t need to move tables out of the way, bring projectors and screens, or worry about power. The rooms we had were classrooms, and it turns out that classrooms are a great place to run classes. Who would have thought? Another nice feature of this space was a an atrium with a central desk that was basically perfect as an admin area – because that’s what it was designed to do! People coming in either entrance would be naturally funneled past the desk, where we had nametags, welcome packets, and other goodies. It actually went quite well. I had a blast, and everyone I spoke to had a great time too. That means a lot to me, that we were able to run this huge conference with only a few minor hiccups (very few of which were visible). There was some feedback that presentations had to be cut short due to not having enough time to cover the expected material. Even if content is rehearsed, presenting to a live audience will definitely lengthen your talk as you answer questions and field other comments and discussion. Next time, I think we’ll explicitly mention this to presenters: that a talk that takes even 40 minutes rehearsed may be too much content when presenting a 50 minute talk to an audience. Of course, the other option is to use longer seminar slots, either 65 or 75 minutes (with a 15 minute break), and going down to 4 or 5 time slots over the course of the day. Another note is that several of our talks had over 60 judges in our largest room. Some seminars are more popular than others. Our solution to this was to place some seminars in a much larger room. The better solution, I think, is to place some seminars in multiple time slots. This allows all groups to have a small, more personal atmosphere, and allows attendees greater variety when selecting seminars. To this end, 5 seminars per time slot may be a better choice than 4 for a conference this size. The biggest complaint was parking. The best nearby parking is $20+ for the day (I paid $22 and walked about five blocks, the closer garages would have been $26 or $30). This is mitigated by the fact that public transportation is very easy, with the entire NJ Transit system and NYC subway system connected to Hoboken Terminal, and with free parking on weekends at several nearby Light Rail stations, a 20 minute ride for only a few dollars. 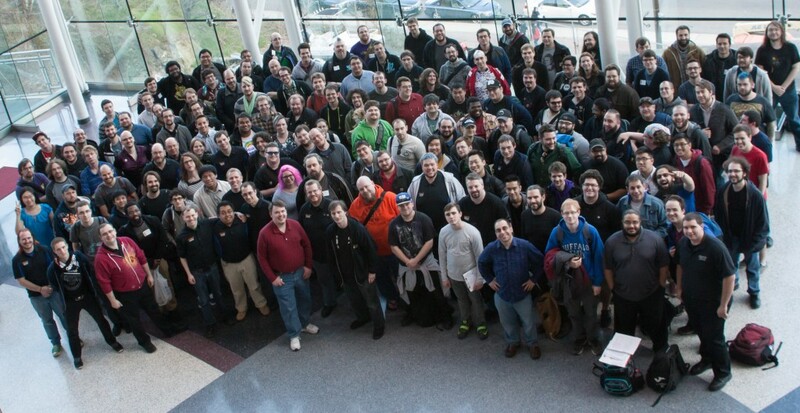 All said, don’t be afraid of large conferences. The US-Northeast has been able to deliver an experience where over 150 judges – that’s a third of our region, and includes more than half of our L2+ – can get together, talk, and participate in other activities before and after the conference, while attending seminars with an average class size of under 30. Mini-conferences and area meetups are great because they allow you to meet up more often and in a less formal or less structured way, but region-wide conferences will always serve an important role for intermingling and sharing of presentations on a regional scale, and even outside the region.